When Zeus ran away from his California home over a year ago, David Guindon thought his husky was gone for good. Thanks to a microchip, however, Zeus has been found. But, Guindon says, the woman who has him is refusing to give him back. Guindon bought Zeus in 2014 as a service dog after he suffered a stroke and heart attack that left him unable to walk, he told ABC Los Angeles station KABC-TV. Zeus helped him get around his San Bernardino home in his motorized wheelchair, Guindon told the station. "If I want to go outside I just tell him, ‘Open the door.’ He'd flip it open for me," Guindon said. "[He would] hold it open long enough so I could get towards it and get out." David Guindon of San Bernardino, Calif., says he has been told that his missing service dog is in someone else's possession. In May 2016, Guindon said, Zeus escaped through the front door. He searched everywhere for the missing dog, posting signs and even hiring a pet detective but Zeus had disappeared. Then, a year and a half later, he received a phone call from the microchip company. The lost dog had popped up in another woman’s possession and she was trying to re-register the dog in her name. "I said, ‘Oh no! I want my dog back,’” Guindon told KABC. He said neither the microchip company nor animal control would release the woman’s information. The only details they would provide were her name, “Shawnee,” and that she lives about an hour away in Lake Elsinore, California. David Guindon of San Bernardino, Calif., holds a tablet with a photo of his husky, Zeus, who escaped from his home in 2016. 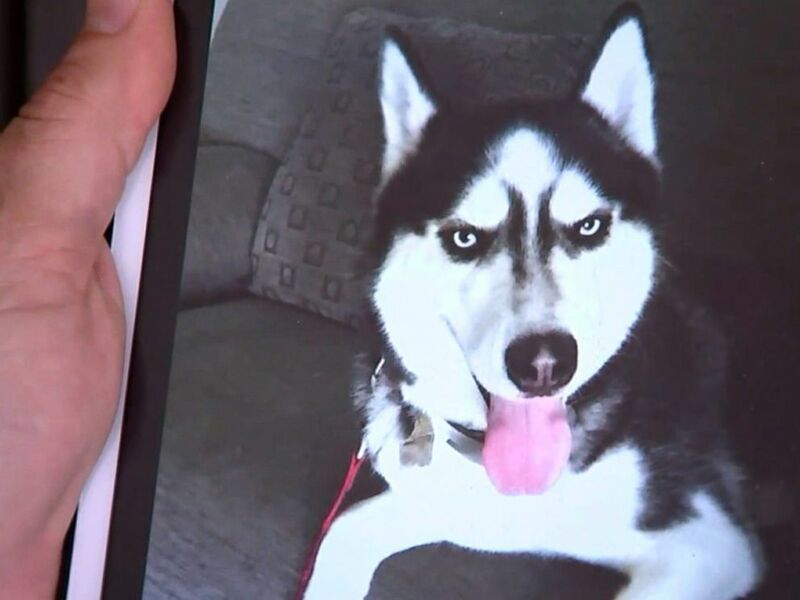 Neil Trent, executive director of the local animal control organization, said Zeus would have been returned if he had been brought to the shelter as a lost animal and the microchip identified Guindon as the owner. He said he has filed a stolen property report with the San Bernardino Police Department but the woman is still refusing to return the dog. The woman hung up the phone when KABC called her, the station reported. Guindon said the next step toward getting Zeus back may be to hire a lawyer.